Suppose, we have the following dataset, the movie with the 3809 has an average rating of 3.17 stars. The movie with the id 4006 has an average rating of 4.0 stars. Let's work out this example in the following steps. Create a new Scala → sbt project in IntelliJ IDEA with a name AverageMovieRatings and add the following dependencies to the build.sbt file. 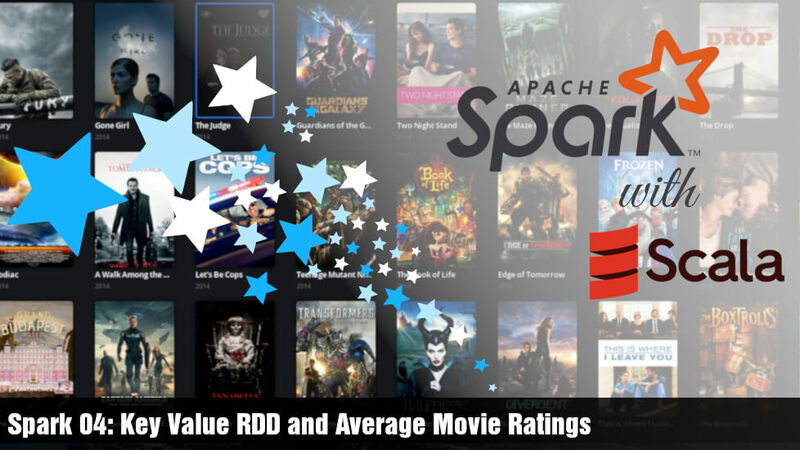 Please check the first article on this series: Spark 01: Movie Rating Counter, for detailed instructions. Create a new package com.javahelps.spark and create a new Scala object named AverageMovieRatings. Please note that so far we haven't done anything new compared to the first program: Spark 01: Movie Rating Counter. Create a new function mapToTuple and map String rows to tuples with selected attributes. Perform reduceByKey operation on the final RDD to find the sum of ratings and number of ratings of each movie. At the end of Step 6, we will have movieIDs mapped to the average ratings. You can collect and print them in this step. However, I prefer to print a list of movieIDs sorted by their average ratings. Spark provides a convenient method sortBy to sort an RDD of tuples by any element in that tuple. The following code sorts the result by average ratings in descending order and prints the output to the console. It means all these movies have an average rating 5.0. I was curious to know which movies received all 5.0 stars ratings. I manually searched the movie id 136556 in the movies.csv file. It is mapped to "Kung Fu Panda: Secrets of the Masters (2011)". No doubt! this movie deserves 5 stars ratings. However remember that these ratings may not match with IMDB or any other sites you follow.